January 10, 2014 | Posted by Lee C.
Write down your resolutions to keep them fresh in your mind. Make your resolution measurable so that you have something specific to aim for. Instead of saying “I’m going to keep the house clean,” say “I’m going to vacuum every Tuesday.” It is one specific item that you can evaluate whether or not it happened every Tuesday. Make sure your resolution is one you can actually do. You may not be able to become an astronaut this year, but you can take a course on astronomy at the community college. Don’t set yourself up to fail before you’ve even begun. Choose resolutions that will change your life and that you can accomplish. Avoid feeling guilty by keeping your resolutions simple. Chances are that if your resolution helps you feel good, you will have no problem continuing it throughout the year. Getting more sleep, exercising more and eating a healthy breakfast are all examples of types of resolutions that will combat stress and help you feel well. Don’t make too many resolutions. You will forget your resolutions or feel too bogged down if you list is too long. Pick one or two resolutions that you feel inspired to keep and stick to those. Write down your resolutions. 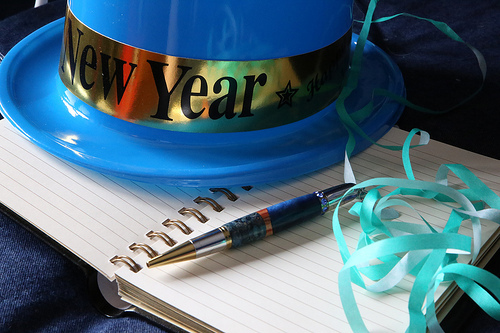 You will be more likely to remember and evaluate whether you are keeping your resolutions if they are written down. You may even want to post them on your refrigerator or mirror where you will be reminded of them regularly. When you write them down you can also track your progress. New Year’s resolutions are not just another to do list or distant wish list. New Year’s resolutions can be practical changes that you can make in your daily life to feel better about yourself. You can reduce stress and improve your health by sticking to a few small resolutions throughout the entire year. What resolutions are you making this year? 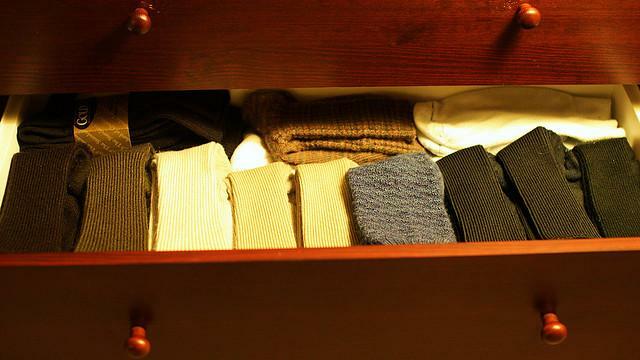 January 9, 2014 | Posted by Lee C.
Matching socks result in a well kept drawer. Start by taking everything out. Be honest with yourself about what you still use and what is worn out or uncomfortable. Don’t be afraid to get rid of things. You can even compost items that are 100% cotton. Once you have sorted out what you want to keep, you can put the rest back in the drawer in an organized fashion. Home for 4 Sweet Home suggests using a plastic expanding file for sorting your underwear. All you need to do is cut the bottom of the file to release the accordion shape. If you need to, you can cut the top of the plastic file to fit the height of your drawer. Then insert your folded underwear in the slots. You can also use small plastic dollar store baskets to sort out your socks and underwear. If you don’t want to buy anything, you can cut portions of shoe boxes or other spare cardboard to create dividers to separate different items in your drawer. Stray, unmatched socks often plague unorganized sock drawers. Sort out your stray socks and place them in a special section in the drawer. If you don’t find a match within three laundry cycles, throw out the stray or repurpose it. Old socks have endless uses, especially for creative kids. To make your drawer look even nicer, line it with shelf paper. You can use shelf paper with rubber grips to keep dividers and baskets from slipping. Place a small sachet in the drawer to give your socks and underwear a faint, pleasant scent. If you are are sensitive to smells, you can use baking powder instead of a sachet. A small container of baking powder with a few holes in the top will keep you drawer from smelling stale without adding extra fragrance. Once your drawer is organized, help it stay that way. Don’t use it to stash miscellaneous items. Get rid of pieces you don’t use and match those stray socks. It will feel so good to start out the new year with fresh and organized drawers. Where do you start your spring cleaning? Image: “My Sock Drawer” by Mr. T in DC.